(AKRON, OHIO) Sept. 1, 2017 - The Akron RubberDucks announced today a special ticket deal for Labor Day, Monday, Sept. 4, to raise money for the Hurricane Harvey relief efforts in Texas. Reserved tickets, which are normally $11, will only be available online until midnight Sunday for $7 with $2 from each ticket set to be donated. Monday's game is the annual Fan Appreciation Day and is scheduled for 1:05 p.m. vs. Erie SeaWolves. 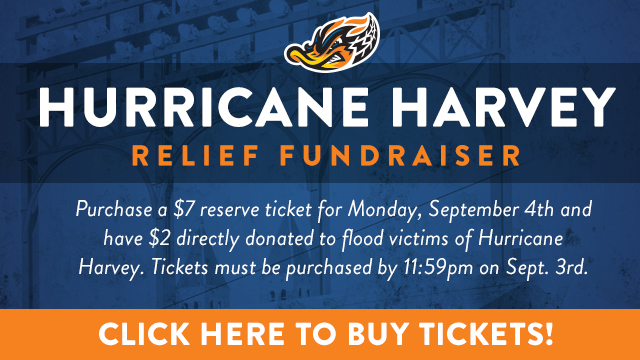 Fans can purchase the Hurricane Harvey relief tickets directly at https://groupmatics.events/event/HurricaneHarvey or through a link on the front of http://akronrubberducks.com. "Even though our season winds down at Canal Park with a fun fireworks-packed holiday weekend, our thoughts and prayers are with the people in Texas who have had their lives thrown into chaos by Hurricane Harvey," said RubberDucks General Manager Jim Pfander. "Our tremendous fans have always supported us with great enthusiasm, and we know they will show that same level of support helping out in this crisis." Fans will have a chance to win fantastic prizes throughout the game such as 2018 RubberDucks tickets, autographed baseballs, and pre-game experiences! All fans will also receive a 10% discount with their game ticket at the BRAND NEW Plato's Closet in Sagamore Hills. Regular-season RubberDucks tickets start at $5 and fans can purchase tickets by stopping at the Akron RubberDucks box office at Canal Park weekdays from 10 a.m. to 5 p.m., Saturdays from 10 a.m. to 2 p.m., or on a game day starting at 10 a.m. and running until gates open one hour before the scheduled game time. Tickets are also available by calling 330-253-5151 or on www.akronrubberducks.com. All RubberDucks games are broadcasted on Fox Sports 1350 AM, the WARF iHeart channel, and the TuneIn Radio App. All RubberDucks home games are also available via MiLB.TV. The Akron RubberDucks are the Double-A affiliate of the Cleveland Indians and defending Eastern League champions. The 2017 season is the franchise's 21st since moving to Akron. For more information about the team, please visit akronrubberducks.com, on Facebook facebook.com/AkronRubberDucks, Twitter @AkronRubberDuck, and Instagram at @akronrubberducks.